The way pay per click advertisers bid in PPC comes down to two options: advertisers can either choose to automatically bid on keywords or manually bid. However, which should advertisers go for? Here is a look at what each bidding option does and if you should go for it or not. 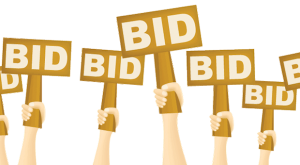 Requires less effort – Automatic bidding frees up some time spent otherwise manually bidding. Therefore, the PPC advertiser can concentrate more of their time and effort on other areas of PPC . Efficient – The algorithm used is extremely efficient at what it does. It can make managing bidding for keywords on even the largest PPC campaigns extremely easy. However, automatic bidding still needs a little maintenance to make sure it adapts and changes to suit your campaign’s needs. There is the potential that when you change something while using automatic bidding, there will be a delay until that change goes live on your campaign. For some campaigns that are very conscience of time, this delay in time might be enough to make or break a campaign. Enables quick changes – Unlike automatic bidding, a PPC advertiser can make a quick change and see that change go live almost instantly. This is great for campaigns that are forced to adapt quickly based on real time events and competition in PPC. Complete utter control – Most advertisers who choose to manually bid do so because they know they have complete 100% control over the bidding of their keywords. For some campaigns, this is a must as no matter how clever the algorithm for automatic bidding is, it might not be clever enough. However, manual bidding requires expert knowledge in handling the day to day life of bidding – for some advertisers, they might make some mistakes which will cost their campaign’s budget. Time consuming – Although you might think manually bidding may take 10 mins here and there to do, you will start to realize that effective manual bidding can turn into something that could take hours of your valuable time. This is when you have to weigh up whether your time spent on manual bidding is worth the benefits you get from it or is it simply better to let an algorithm automatically bid on your behalf.